Q&A: Where do you find your images? I was recently asked where I find my images for SoulCollage, and the nerd in me would absolutely love to tell you! The answer is, almost all of them come from magazines, mostly magazines I subscribe to now, or subscribed to in the past. About half are from ads (some of my most powerful images have come from ads), half editorial. Occasionally I’ll use an image from another hardcopy source, like a museum flyer, or a World Wildlife Federation calendar. The images for a recent card, for example, came from a wide variety of magazines: US Harper’s Bazaar, More, Lapham’s Quarterly, Town & Country, Elle Décor, and Cottages & Bungalows. The last one I got from the newsstand; the others I subscribe to (some free through Recyclebank). I have always read a lot of magazines, and SoulCollage has finally given me a use for them once I’m finished reading! Some of my favorite sources are magazines from the past, such as Victoria and O Magazine. Victoria is still published and still a great source, although it has changed hands. The emphasis is now more on the photography than the text. The annual British issue is a favorite of mine, and especially useful. I still find the occasional image in O, but it’s much more text-intensive than it used to be (due to the overall contraction of the industry), and no longer features the two-page photographic “Breathing Space,” which was great for background images. If you don’t have your own stash of vintage magazines, you may be able to find one to raid at a relative’s house (sometimes it’s nice to be related to hoarders! ), or at a public library’s magazine exchange. I much prefer National Geographic Traveler to National Geographic, but if you like the original, you should be able to spot stacks of the yellow spines at garage sales and perhaps thrift stores. I find fashion magazines like US Harper’s Bazaar, Elle, and W useful, especially the oversize ones (Elle is not oversize, the others are). They’re great for background images and jewelry (which I like to include on a lot of my cards). Oversize magazines are good because the larger the page, the easier it is to get the unobstructed background image you want (SoulCollage cards are typically 5 x 8 inches). European A5 magazines are great for the same reason. British magazines are especially strong, and this holds true across categories. I’ve found great images in UK Country Living (including some stunning and rare animal images), Scotland Magazine, and Porter. I’ve subscribed to some, but mostly I buy them occasionally at the newsstand. Every few weeks I’ll visit the largest newsstand near me, and generally come home with a new magazine or two. Art magazines are another good category to browse at the newsstand. SoulCollagers are typically looking for particular totem animals, and I’ve found them before in American Art Collector, as well as good background images. I also like magazines specifically focused on animals, like the British World of Animals (which I buy occasionally at the newsstand), or a regional magazine like Texas Parks & Wildlife. But good animal images are available in a surprising variety of magazines. Travel magazines tend to have lots of useful images. My favorite is Afar. Spirituality & Health uses art as illustrations, and is a great source, along with its special issues. I’ve also gotten some nice images from Shambhala Sun, a Buddhist magazine. Both of these also feature great content. As you might expect, gardening magazines are great for pictures of flowers, but I’ve also found good ones in garden stories in decorating magazines, as well as Victoria. I’ve used pictures of heather on multiple cards, as well as many other flowers. I generally like to read the magazines I receive or buy, then go back through them, pulling the useful images and categorizing them. (Right now my categories are Backgrounds, Animals, People, Divine, Flowers and nature, Objects, and Architecture.) This way I don’t drive myself crazy by pulling out a page that makes it impossible to finish reading an article. A few magazines, like World of Animals, have so many useful images that I just file the whole magazine in the appropriate box. Once I’m finished with a magazine, I generally pass it on to other SoulCollagers (I usually pull only the images I think I’ll use myself). If you SoulCollage, which magazines do you find most useful? 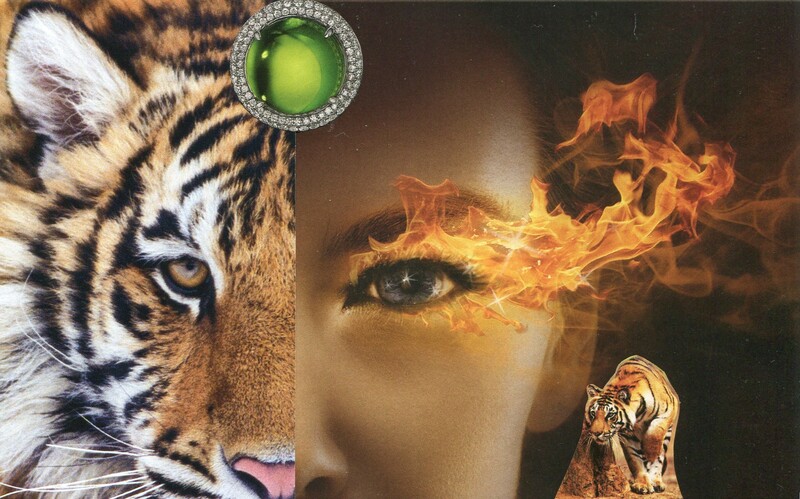 This post is illustrated with my SoulCollage card Courage + Tiger totem.